When you have multiple related views (components) on the page, you can bind them together or sync their data, so that any changes in one of the views would trigger changes in the bound/synced ones. The main component is called master, while the bound one is a slave. The master view appears to be the data source for the slave one. the slave can take new data from the server side. When you bind data to any component, it means that when you select an item from one component, this item will be the data source for another component. Most typically, binding is used with some data-presenting component and a form / htmlform. When you sync data, it means that all changes in the datastore of one component (such as filtering, sorting, etc.) are reflected in the other component at once. Data binding is implemented with the help of the bind function, that is called from the slave component and has a master component as a parameter. 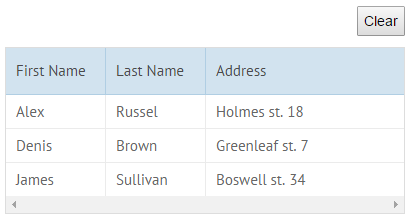 datatable column ID = field name in a form. Changes in the slave component will affect the master one, which means that if you edit the info in the form and then save it (click the Submit button), the list item will have this new data. From now on, list changes cannot affect form data and vice versa. When no item is selected in the master component (here:list), data from the slave one can still be pushed to it. In other words, if you call the save() method for the bound form when no item is selected in the master, a new item will be added to master collection. Study the corresponding article for details. Data syncing allows making a full or partial copy of data from one data-presenting component and pass it to the other one. Any change in the master component results in the same change in the slave one. There can be more than one slave component. In this case, all slaves change simultaneously on master component change. Note that this functionality works with data components (their data stores), that's why data property is used everywhere. The datasets of the two components are absolutely identical. A slave view shows only the data items that comply to a certain criterion defined by the function. Here only the films shot after 1994 will be shown. Related into on data filtering. In case of two and more components synced to one data source (either a visible component or non-visible dataCollection), it seems nice to synchronize user operations as well. For instance, if an item is selected in one of components, the same item should be selected in the synced one. This is easily done using the API. Let's assume that we have a dataview and datatable both synced with the same dataCollection. One-time syncing allows synchronizing the data of two components (one of them can be DataCollection) at a chosen time of the application flow without tracking data changes afterwards. Note that it's a DataStore method, so it should be called for the data of the component.